The walls of any Italian home are always well decorated. In no Italian home will you find the walls being bare and dull. The walls are adorned either through exquisite Italian Frescos or antique paintings. So if you want to replicate an authentic Italian style theme in your interiors one place to start with is the wall unit. One of the best ways to store books and other memorabilia is through the proper usage of wall units. Noone seems to do this better and with more style than the Italians! Such wall units represent a fine blend of functionality and aesthetic appeal combined into one. Most of the wall units are made of antique wood like mahogany, cherry, walnut, oak etc. These are usually covered with glass etc. to ensure better visibility. Many of them even have fine and ornate carvings on them. In fact the more antique the piece the more ornate it will be! For the more urban minded homeowner a more stylish and less heavy wall unit is perfect. For example a Double U Modern Italian Shelving shown above is very aesthetically designed and also serves a nice way to place showpieces and books. We all love our wine and beer and Italians love them even more so! No wonder then that they have dedicated bars and bar sets in a separate room or dining space to store all their liquor. These bar sets are very intricately done up and the common material preferred is wood. Solid wood provides a very nice, authentic classy finish to the room. These bar sets come in various designs ranging from single, double, triple and even quadruple panel types. For added functionality try a Bancone Quadruple Panel Bar below to serve enhanced storage. Such a panel will occupy almost an entire wall. So make sure you have ample space in the room to accommodate such a unit. These bar sets also double up as nice buffet tables. So when guests come over you can wine and dine in style – without the hassle of bringing the food from the kitchen each time! For the writer or poet in all of us there is an equally stylish Italian desk! Yes, Italians are born romantics. So naturally they devote time and attention to purchasing their desks to exercise their writing skills! Traditional Italian desks are all about opulence and style combined into one holistic package. Right from the type of wood used to the carvings incorporated to the finish – all aspects are thoroughly studied and mulled upon before getting it made. If you really want a customized Italian desk based on your unique needs you can get it done these days. There are several stores and shops that have skilled crafts-persons who can replicate antique styles into the desk. Take for example this Classic Italian Writing Desk. It is perfect for the writer in you. The delicately carved and ornate legs will accentuate any room and ambience. Even the chair that goes with is perfectly complements its style! One of the best accents to place in any room is a mirror or a clock. Beautiful antique mirrors have been found in many a period Italian home. These usually have very ornate frames made of wrought iron or wood, gold, ivory etc. The mirror is a place where every Italian woman prefers to spend her time. So it only makes sense that adequate time and attention to detail be provided while purchasing a mirror. Even an antique looking clock can really spice up an otherwise ordinary looking room. 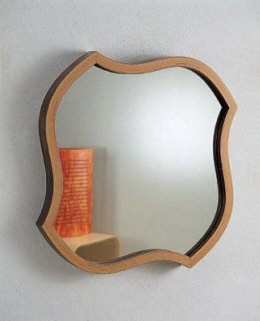 For a truly stylistic and modern looking mirror that will make heads turn try out this Crow Modern Italian Mirror. The long, clean lines and beautiful framework make this mirror a clear winner. If you prefer more unusual designs and cuts then the Vanesio Contemporary Mirror is sure to please. This is great for rooms which have a trendy, upbeat modern look to them. When you think of Italian stone furniture you need to think marble, granite and other rich looking stones. Yes, Italians are known for their opulence and love of the grand. Yet in spite of using such rich looking stones they make it subtle. They never make the mistake of overpowering a room with too much. The idea is to exude an air of quiet sophistication and chic style without it screaming out loud. Classical statues made of antique stone can offset any ordinary looking room. Even small accents to an existing furniture can make the dullest of furniture look stunning. 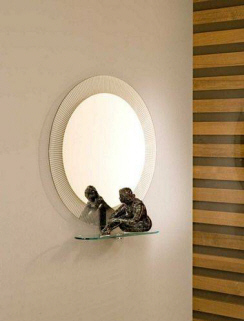 For example, try attaching a small stone statue to an existing mirror and see how beautiful the effect looks! The range of stone furniture extends from dining tables in various shapes and sizes. You will find rectangular, trendy looking stone tables such as the Brezza Crystal Stone Dining Table. Then there are oblong and cute circular tables that can make your room look like a million bucks! Plasma TVs are a necessity of modern life. Italians love the good life and eating and watching TV are definitely one of them! That is why the TV stand is given much importance both in terms of functionality and design. For a really trendy look to a room try having a Modern Italian Wall Unit which doubles up as a TV stand as well! Try accentuating the sides with black coloured panes for a truly fabulous contrasting effect! If you do not prefer something heavy for a TV stand or if space is a constraint then a lighter more airy stand is perfect. Instead of using wood materials like metal and glass provide a more urban appearance. For example a chic Italian Plasma Screen TV stand will do wonders to accentuate your room in style! You could even try decorating this stand with a nice flower vase and cute flowers in it. Or perhaps place a trendy showpiece on it.